We’d love your help. Let us know what’s wrong with this preview of The Urban Sketcher by Marc Taro Holmes. Make the world your studio! Capture the bustle and beauty of life in your town. Experience life as only an artist can! Join the rapidly growing, international movement of artists united by a passion for drawing on location in the cities, towns and villages where they live and travel. Packed with art and advice from Marc Taro Holmes, artist and co-founder of Urbansketchers.or Make the world your studio! Experience life as only an artist can! Join the rapidly growing, international movement of artists united by a passion for drawing on location in the cities, towns and villages where they live and travel. Packed with art and advice from Marc Taro Holmes, artist and co-founder of Urbansketchers.org, this self-directed workshop shows you how to draw inspiration from real life and bring that same excitement into your sketchbook. Inside you'll fi nd everything you need to tackle subjects ranging from still lifes and architecture to people and busy street scenes. 15 step-by-step demonstrations cover techniques for creating expressive drawings using pencil, pen and ink, and watercolor. Expert tips for achieving a balance of accuracy, spontaneity and speed. Practical advice for working in the field, choosing subjects, coping with onlookers, capturing people in motion and more. Daily exercises and creative prompts for everything from improving essential skills to diverse approaches, such as montages, storytelling portraits and one-page graphic novels. To ask other readers questions about The Urban Sketcher, please sign up. While I didn't get to finish reading a library copy of this one before I had to return it, the sections I did dip into were great: excellent layout and balance of text and images, detailed demos and exercises to try. This would be wonderful for anyone who wants to improve their urban sketching with the help of some structure and guidance. Really liked the book, the drawings were really good and the information was helpful for a lot of the stuff I am working on. The extremely simple and organized way Marc presents his techniques is great both as a starting point for someone new to pencil/ink drawing/watercolor painting and for more advanced sketchers/painters who can benefit from his method which encourages forethought and organization in the painting process, among other things. The book itself is clearly well thought-through (it is pedagogical, accessible, explanatory in words and images and logically construed) as is each step of his painting process The extremely simple and organized way Marc presents his techniques is great both as a starting point for someone new to pencil/ink drawing/watercolor painting and for more advanced sketchers/painters who can benefit from his method which encourages forethought and organization in the painting process, among other things. The book itself is clearly well thought-through (it is pedagogical, accessible, explanatory in words and images and logically construed) as is each step of his painting process. The most useful idea I got from Marc's book is idea of the "three-pass drawing/painting". He explains how easy it can be to make a painting just in three "passes" over it (either pencil drawing - ink drawing - ink shades or pencil drawing and then three coats of watercolor paints). He uses metaphors and visual language to make his advice and techniques easy to remember and illustrates every point with photos of his own paintings and painting-in-process. I finally have the courage to start working outside (which I have already done by the way) and have allowed myself a bit of freedom of expression. What Marc also points to in the book is the freedom that ink and watercolor provide as artistic techniques - it's about expression, not always mimetic representation. Personally, I generally learn skills best through instructional videos as opposed to the written word; even when detailed photographs are included. So, my rating is based more on a personal preference than on the actual content. With regards to the content, the instructional steps and tips are clear, however, I think Stephanie Bower's methods of attaining realistic perspective and architectural sketches to be superior to Holmes's methods. As a side note, I find Holmes's sketches to be messy and n Personally, I generally learn skills best through instructional videos as opposed to the written word; even when detailed photographs are included. So, my rating is based more on a personal preference than on the actual content. Someone told me that sketching is ability born with not trainable. Well, I have found this book defeated that statement totally and I have started my sketch journal with the techniques from this book. Recommended to all sketchers. A nicely written and illustrated book for those looking to get into urban sketching, offering lesson-style assignments to help you learn the different aspects of on-scene drawing one sketch at a time. The best book on urban sketching skills from my opinion. Good methodology and great examples. While the tips were good and I like his informative style, the photos were not of good quality which made the book disappointing. I love this book, there are so many great techniques and tips, and plenty of images. I often refer back to thus book over all of my others. Simple but useful. Instructions are clear, key points are well pointed out. The explanations were very clear and the suggestions good. Enjoyed the context and context I’d recommend this book! Enjoyed it! Very helpful for anyone looking into sketching as a whole as well as watercolor painting. Well crafted, easy to read and understand, beautifully illustrated in. Well worth the money or having the Amazon prime. Enjoy! The author/artist lays out a simple to follow three step process on sketching/drawing in public. He then shifts gears into a somewhat disjointed water color how-to. Both sections are well done, but they don't really tie together. I've just gone through the book, but will be doing the exercises over the next months. Bought this as a supplement to Marc Taro Holmes' Sketching People in Motion online course, since I can't have internet accesa all the time. Love the progression of the book and I'm sure it will help me develop my skills in the coming months! 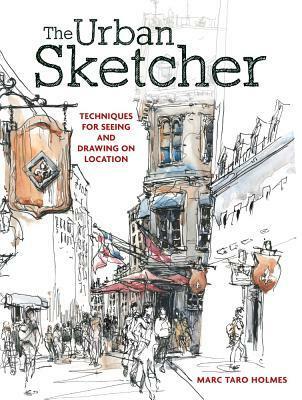 Author does a good job giving reader the tools and methods to become an urban sketch artist. The exercises break down skills into reasonably reachable pieces, and gets you to think differently about your relationship with drawing and painting. Has inspiring illustrations, with good usable techniques. OK, I did not so much 'read' this book as 'go through it'. The exercises look interesting, and the advice sound. I am not so much a step-by-step person, but in this case, the progressions for the exercises seem to make sense. The copy I have now is from the library. I think I will buy my own copy so that I can take my time with the exercises and the practice. Good breakdown of approaches with step-by-step photos. Some instructions are too vague to be useful ("sketch just the details you need" does not explain how to pick out essential details from a noisy scene.) Requires decent draftsmanship as well as a basic grasp of values & colour theory--not for beginners. Great book for inspiration and techniques on how to draw on the go. Ive been wanting to do more plein air sketching and painting. This book was a great help. The explanation were clear and easy to follow, with great, helpful photos. Now Im inspired to go out there and sketch! Recommended for everyone interested in sketching outside. Great book for inspiration and techniques on how to draw on the go. I´ve been wanting to do more plein air sketching and painting. This book was a great help. The explanation were clear and easy to follow, with great, helpful photos. Now I´m inspired to go out there and sketch! Great instruction, great techniques, super examples. Covers it all: buildings, streets, people, foliage, and composite scenes too. His step-by-step examples are clear and helpful to the street on-location sketcher. This book has really easy to understand explanations and is good for veteran and beginning artists alike. This type of sketching is difficult for some because it's a little spontaneous but I think this book does a good job helping people out. I got so much more than I expected out of this and have been incorporating much of the advice into my sketching and painting over the past couple of weeks. this is a great one to revisit frequently. In particular, the author does a fantastic job of introducing watercolor to sketch work. Divided into three sections: pencil, pen and ink, and watercolor. Includes demonstrations, tips and techniques, and exercises for practicing ability to see and sketch. Solid book and some good ideas. Probably should not be the first book you read. It was my first and some of it didn't make a lot of sense. Excellent advice and examples for skill-building. This book will be my companion for years as I apply its lessons. Just the kind of book I was looking for! Lots of good advice and inspiring drawings. Nicely written and illustrated - just not much useable or teachable information. Practical techniques for quick seeing/drawing in busy urban areas! I'll recommend this book to anyone who asks me about drawing on location and keeping a daily sketchbook! definitely a book I want to buy. highly recommended.